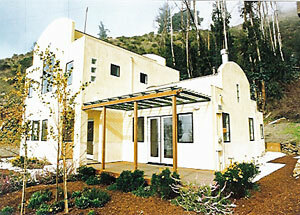 Born out of the ashes of the 1991 Oakland Hills fire, the clients needed the home rebuilt on a shoestring budget. The challenge: Bring together modern/Mediterranean vocabulary while maximizing space, light and style for under $125/square foot. The resulting project features a distinctive barrel vault, a copper roof and clerestory windows filling the space with natural light despite the canyon-like setting. [Materials: Oak flooring, copper light shrouds/details by Verdigris Copperworks].